Not all passwords provide equal protection. Some formats are more resistant to brute-force attacks than others. As an example, Microsoft Office 2013 and 2016 employ a smart encryption scheme that is very slow to decrypt. Even the fastest available GPU units found in NVIDIA’s latest GeForce GTX 1080 will only allow trying some 7100 passwords per second. One solution is employing a custom dictionary, possibly containing the user’s passwords that were easier to break. Observing the common pattern in those other passwords may allow creating a custom mask that could greatly reduce the number of possible combinations. 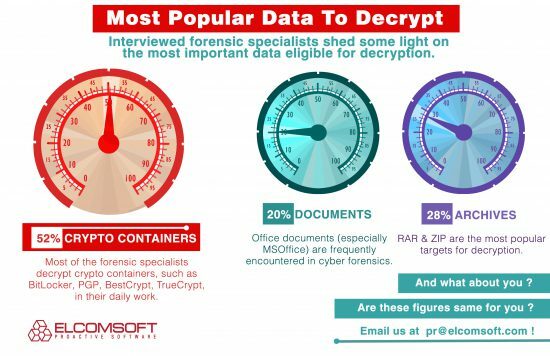 How often do you think forensic specialists have to deal with encrypted containers? Compared with office documents and archives that are relatively infrequent, every second case involves an encrypted container. It may vary, but these evaluations are based on a real survey conducted by our company. It is hard to overestimate the importance of the topic. In the first part of our story we discussed the way of getting access to encrypted volumes using an encryption key. Now, let’s see which other ways can be used. Unlike Elcomsoft Forensic Disk Decryptor, Elcomsoft Distributed Password Recovery does not search for existing decryption keys. Instead, it tries to unlock password-protected disks by attacking the password. The tool applies an impressive variety of techniques for attacking the password. In this case, the whole disk encryption scheme is only as strong as its password. Fortunately, the tool can execute a wide range of attacks including wordlist attack, combination attacks, mask attacks, smart attacks and so on and so forth, with advanced GPU acceleration and distributed processing on top of that. The whole sophisticated arsenal comes in particularly handy if we speak about more or less secure passwords. In the world of Windows dominance, Apple’s Mac OS X enjoys a healthy market share of 9.5% among desktop operating systems. The adoption of Apple’s desktop OS (macOS seems to be the new name) is steadily growing. This is why we are targeting Mac OS with our tools. This time, let’s talk about Mac OS X user account passwords. Not only will a user password allow accessing their Mac, but it will also allow decrypting FileVault 2 volumes that are otherwise securely encrypted with virtually unbreakable XTS-AES. There is also an additional unlock method available called Institutional Recovery Key. These recovery keys are created when system administrators enable FileVault 2 encryption with FileVaultMaster.keychain. This method requires additional steps to activate, and is typically used in organizations with centralized keychain management. 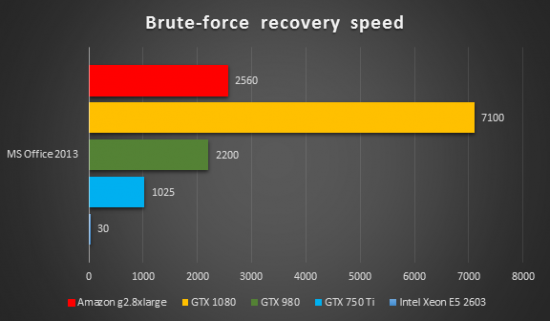 During the last several years, progress on the CPU performance front has seemingly stopped. Granted, last-generation CPUs are cool, silent and power-efficient. Anecdotal evidence: my new laptop (a brand new Macbook) is about as fast as the Dell ultrabook it replaced. The problem? I bought the Dell laptop some five years ago. Granted, the Dell was thicker and noisier. It’s battery never lasted longer than a few hours. But it was about as fast as the new Macbook. Computer games have evolved a lot during the last years. Demanding faster and faster video cards, today’s games are relatively lax on CPU requirements. Manufacturers followed the trend, continuing the performance race. GPUs have picked up where CPUs have left. NVIDIA has recently released a reference design for GTX 1080 boards based on the new Pascal architecture. Elcomsoft Distributed Password Recovery 3.20 adds support for the new architecture. What does it mean for us?